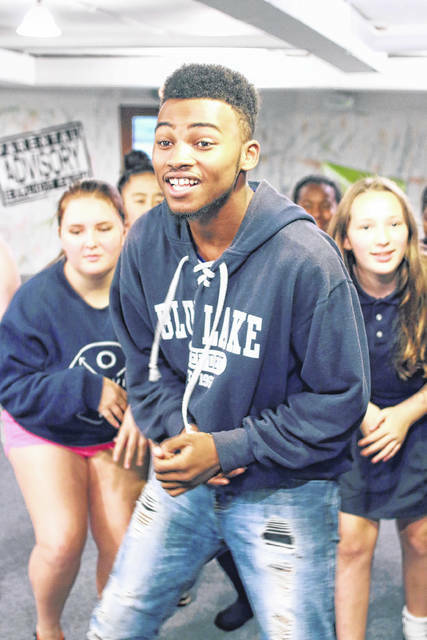 Hayes High School student Antonio Mitchem portrays Seaweed Stubbs in the Arena Fair Theatre production of “Hairspray.” The Broadway hit will be presented Friday through Sunday, Nov. 3-5 at the Merchants Building at the Delaware County Fairgrounds. Showtime is 7:30 p.m. Friday; 2 p.m. and 7:30 p.m. Saturday; and 2 p.m. Sunday. Tickets cost $20 each. For ticket information, go to www.arenafair.com. A delightfully comedic, as well as socially moving musical will be performed live by the Arena Fair Theatre this weekend. The production of “Hairspray” will be presented not in 1960s Baltimore, but at the Merchants Building and the Coliseum located at the Delaware County Fairgrounds. The show runs Friday through Sunday, Nov. 3-5. Created by American screenwriter and film director John Waters Jr., the show was first performed on Broadway in 2002, and has since then won numerous Tony, Drama Desk and Theater Awards here in the U.S. It’s also been performed in London and Australia. The course of the musical follows the life of main character Tracy Turnblad, who dreams to be on a popular local TV show, “The Corny Collins Show.” When she wins a role on the show, however, Tracy becomes determined to integrate the show, using her newfound social influence and her friends to help succeed in her mission. The musical, packed with wit, catchy tunes, and a powerful message of equal rights, is both a beautiful glimpse of groovy blues music and the struggle for racial equality in the 1960s. Arena Fair “is pulling a major magic transformation by creating a theater at the Merchants Building at the Delaware County Fairgrounds,” Patterson said. Notable actors and actresses include Francine Butler, who will play Motor Mouth Maybelle, Jamie Brando in the role of Velma Von Tussle, and choreographer Lee Webb. Butler works as an intervention specialist at Hayes High School, and has been performing in theater since elementary school. Butler has additional background as a choreographer and director in various dramas, films, and musical productions. She also previously toured with the dance company, Sounds in Motion, for several years. Patterson said the cast includes young people from various local schools. “The production stars talent from the surrounding four counties and includes new stars from Hayes, Buckeye Valley, Delaware Christian, Jonathan Alder, and the Olentangy high schools,” he said. General admission seating costs $20 per ticket. Showtime is 7:30 p.m. on Friday, Nov. 3; 2 p.m. and 7:30 p.m. on Saturday, Nov. 4; and 2 p.m. on Sunday, Nov. 5.